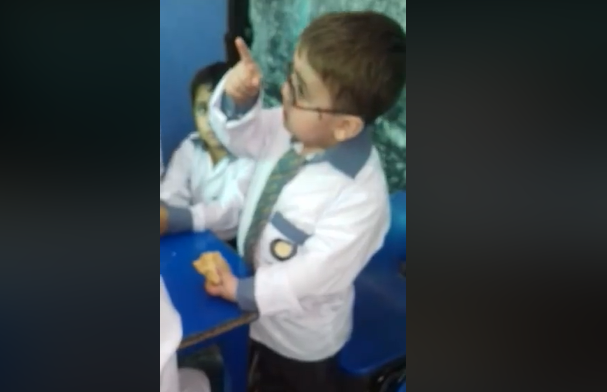 This Adorable Little Boy Saying "Oyeee" Is Winning Everyone's Heart And Haye, Sadqayy! Little kids always have the potential of going viral based on all the adorable things they do. Today we have found another one and we are trying to find out what his name is as we just cannot get enough of him. 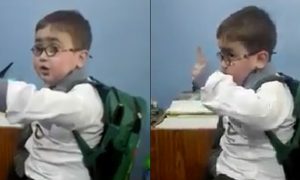 In an adorable going viral, the kid is seen being feisty with his teachers over his school bag during lunch time. The teachers are teasing him in a cute manner and he has an adorable conversation with them. The teachers are telling him that they till take his school bag away from him and he says, “Oye, main tumhara chutti bnd kardo ga,” on how he would want his bag back. The teachers tease on him why would he be needing his bag over the weekend, to which is says, “Main parhai karo ga. Doctor bno ga. Ilaaj karo ga logo ka,” to which everyone breaks into laughter on how intelligent the little boy is. The Video Of this Little Boy Is Going Viral and Everyone Is Loving It! With 101,770 shares and 7.4k comments, it is needed has got everyone’s attention for a little dose of happiness this boy is. He speaks in an adorable manner and his “oye” are just too cute. Let’s hope we get to see more of this boy on our timelines!